WASHINGTON -- When Democrats decided they wouldn't let the GOP be "God's Only Party," they weren't kidding. 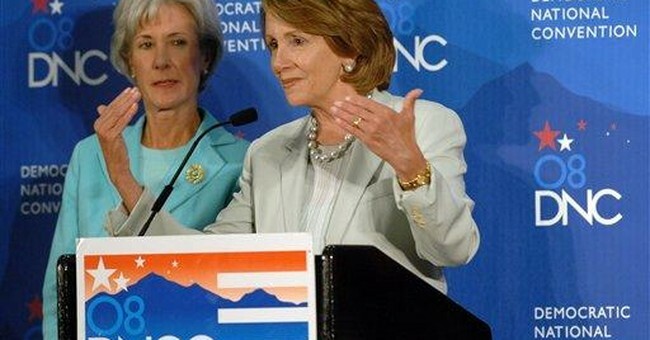 Thanks to House Speaker Nancy Pelosi, none other than St. Augustine has been summoned to Denver. He was resurrected as Pelosi was trying to respond to the question that refuses to die: When does human life begin? This time, it was Tom Brokaw asking on Sunday's "Meet the Press." Citing Barack Obama's recent pass on a similar question -- "At what point does a baby get human rights?" -- Brokaw asked Pelosi what she would say to Obama were he to ask her advice. Pelosi didn't finesse her answer, as Obama did when he said the question was above his pay grade, but she may wish she had. "I would say that as an ardent, practicing Catholic, this is an issue that I have studied for a long time," Pelosi began. "And what I know is, over the centuries, the doctrines of the church have not been able to make that definition. ... St. Augustine said at three months. We don't know. The point is, is that it shouldn't have an impact on a woman's right to choose. ... I don't think anybody can tell you when life begins, human life begins." Few paragraphs have contained more falsehoods. The reaction was swift from Denver's archbishop, the Rev. Charles J. Chaput, among others, who condemned Pelosi's comments during Mass that same evening. Blogging on Monday, Chaput quoted Jesuit John Connery, author of "Abortion: The Development of the Roman Catholic Perspective," who concluded that "The Christian tradition from the earliest days reveals a firm anti-abortion attitude." It is true that laws and penalties concerning abortion have evolved through the ages. "Right to life" is a relatively new concept. It is also true that Augustine -- and St. Thomas Aquinas eight centuries later -- subscribed to a "delayed hominization" theory, meaning that abortion couldn't be homicide because the fetus doesn't receive a soul until a certain point in its development. Augustine even thought that "hominization" occurred earlier for males than for females. Is it possible that the same authority whom Pelosi invokes to justify her belief in choice also ranked the female fetus below the male on God's "Ensoulments To Do" list? We may forgive Augustine, of course, because people didn't know much about nascent life in the early 400s. The ovum wasn't discovered until 1827. Fetal imaging, now routine for expectant parents, was unimaginable. If Augustine had known then what we know now, would he stand by Pelosi as she asserts that when life begins should have no bearing on a woman's right to choose? The U.S. Supreme Court ruled as much in Roe v. Wade, obviously, but Justice Harry A. Blackmun dodged the question of when life begins using the same rationale as Pelosi -- that because scientists, theologians and others couldn't agree on when life begins, then a woman's privacy trumped the unborn's right to due process. One may choose to believe that out of convenience or conscience, but the logic of the court was both self-contradictory and incorrect, according to Robert P. George, a professor of jurisprudence at Princeton and a member of the President's Council on Bioethics. By its ruling, says George, the court implicitly determined when life begins (against the fetus), while ignoring science that long before had determined the facts of human embryogenesis. In his new book, "Embryo," George and co-author Christopher Tollefsen, associate professor of philosophy at the University of South Carolina, left religion behind and set out to establish the embryo's personhood by reviewing all the major scientific works on human embryogenesis and early intrauterine development. Included was American medicine's most prominent human embryology text, "The Developing Human," whose authors are not imprecise on the matter of life: "Human development begins at fertilization when a male gamete or sperm (spermatozoon) unites with a female gamete or oocyte (ovum) to produce a single cell -- a zygote. This highly specialized, totipotent cell marked the beginning of each of us as a unique individual." In other words, human life begins at conception. That is not a religious posture, but a scientific fact that the lowest paid laborer on the planet can assert without qualm. What we do with that understanding is another matter, but no one in the 21st century should pretend not to know when human life begins. On this matter at least, the church and science are in agreement.